The PWCC Vault is now live! We at PWCC are not professional graders so we trust in the reputation and opinion of 3rd party professional graders. Professional grading is subjective and different 3rd party graders will often disagree over the grading on a single card. We do our part by providing fast and professional service. I'M SORRY ABOUT IT BUT ASSURED THAT I WILL WORK WITH YOU IF A PROBLEM HAPPENS. 1 CARD AND MORE. CARD IS GRADED 8 BY KSA IN NEAR MINT/MINT CONDITION. 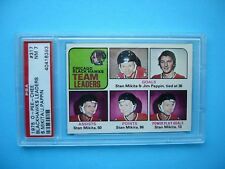 GREAT COLOUR & GLOSS--A SUPER SHARP, CLEAN & ATTRACTIVE VERY IMPORTANT CARD FROM THIS VALUABLE O-PEE-CHEE HOCKEY SET! I am breaking up a HIGH-END 1974/75 OPC WHA Hockey set. I am sorry for the inconvenience. CARD IS GRADED 7 BY KSA IN NEAR MINT CONDITION. GREAT COLOUR & GLOSS--A VERY SHARP, CLEAN & ATTRACTIVE VERY IMPORTANT CARD FROM THIS VALUABLE & UNIQUE O-PEE-CHEE INSERT HOCKEY SET! 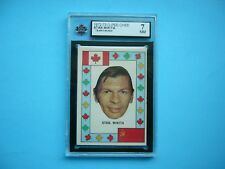 FEATURES STAN MIKITA AND JIM PAPPIN. GREAT COLOUR & GLOSS--A VERY SHARP, CLEAN & ATTRACTIVE VERY IMPORTANT CARD FROM THIS VALUABLE O-PEE-CHEE HOCKEY SET! The card has nice color, a beautiful smooth surface gloss, and NO creases, SEE SCAN. NEWFOUNDLAND 15%. P.E.I. 14%. NOVA SCOTIA 15%. SASKATCHEWAN 5%. Philly Show, Valley Forge PA - November 30 - December 1. 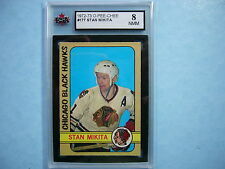 1964 Topps #106 Stan Mikita All-Star Short Print - SGC 84 Near Mint + Centered! Graded Near Mint 84 by SGC. Would have likely graded NM-MT or higher if not for a very slight "ding" in the top right corner. Appears to be much nicer than the given grade. Challenging Short Print - difficult to find in top grade!